After the eBook fiasco, I really needed something comforting. What do I turn to? Bolognese. However, I had an intense gym workout that morning and I didn’t want to “undo” that with a big bowl of carbs. Oh and also, I don’t even have real pasta in my pantry. I did have about 4 butternut squashes. I also had gruyere cheese that I was saving for a “wine and cheese” night. But heck, ya gotta prioritize! And something cheesy was a number 1 priority. I wasn’t sure which way to stuff the acorn squash. Should I roast it, scoop out the flesh and combine it into the bolognese (featured to the left, below)? Or, should I roast it and then just stuff in the bolognese (featured to the right, below)? Well, as the recipe title says, I tried it both ways. I liked the one on the left better. I loved the way the flavors of the acorn squash mixed in with the bolognese. Plus, I was able to stuff in more butternut squash noodles. 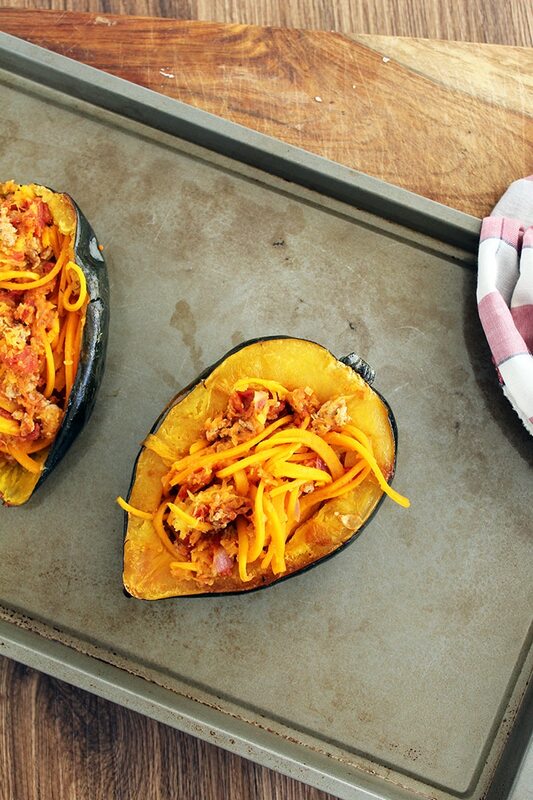 Each spoonful was jam-packed with bolognese, acorn squash and butternut squash noodles. To be honest, I could have eaten this without the gruyere, it was so juicy. If you don’t eat dairy, skip it! But, the gruyere really does put the cherry on top. I couldn’t wait to cut in when it came out of the oven. Waiting to eat it while I photographed was torture. Finally, I dug in. 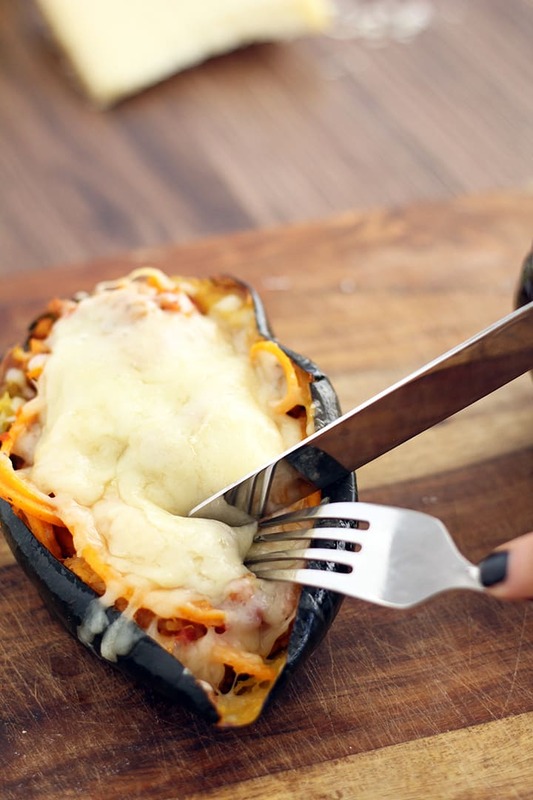 Gruyere cheese is amazing and adds a silky smooth coating to the vegetables. Outstanding. This is the type of dinner you want when you’ve had a long or rough day. It’s got everything – lean proteins, loads of veggies and its topped off with something that makes you feel like you’re eating something indulgent. Right up my alley. Cut the acorn squash in half. Scoop out all of the insides and make sure all seeds are removed. Drizzle lightly with olive oil and massage into squash flesh with fingers. Place the acorn squashes cut-side down on a baking tray. Roast in the oven for 30 minutes or until easily pierced with a fork. Once done, remove from oven and flip over so that the cut side is up to cool. Set the oven to broil. While the acorn squash is roasting, make the bikini bolognese. Five minutes before the acorn squash is done roasting, add the butternut squash noodles onto a baking tray coated with cooking spray. Roast for those last 5 minutes and then add it to the skillet with the bolognese. Stir to combine and spoon half of the mixture into 1 of the acorn squash halves. Set aside. For the other acorn squash, spoon out the flesh of the acorn squash and add it to the remaining bolognese mixture. Stir to combine thoroughly and add back into the acorn squash skin. 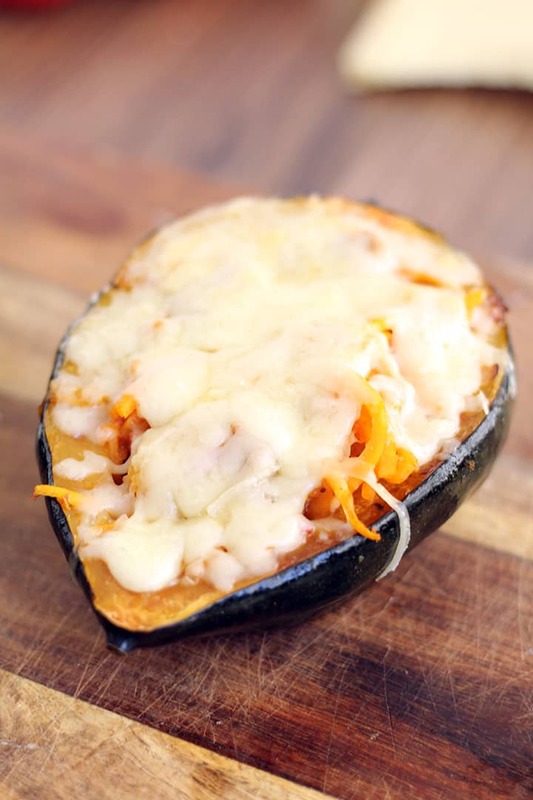 Sprinkle each acorn squash halve evenly with gruyere cheese and place in the oven to broil for 5 minutes, checking periodically to make sure the cheese is bubbling but does not burn. 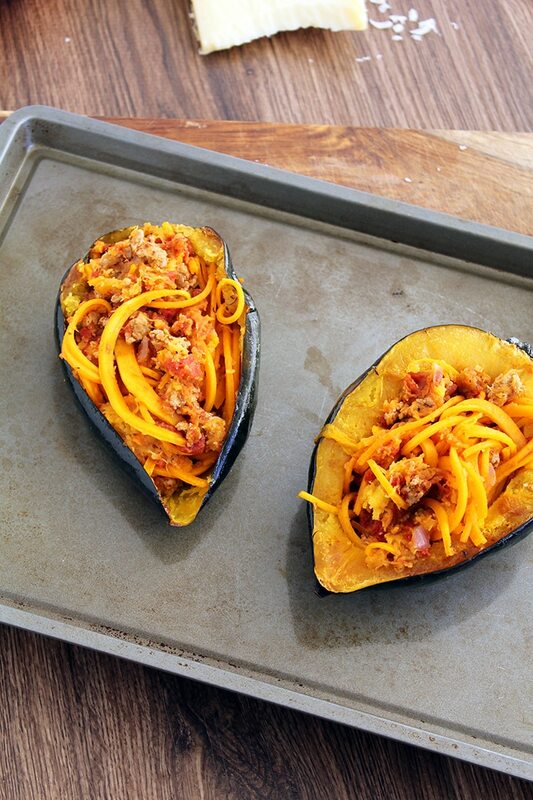 Remove the acorn squash from the oven and enjoy! They both look phenomenal! 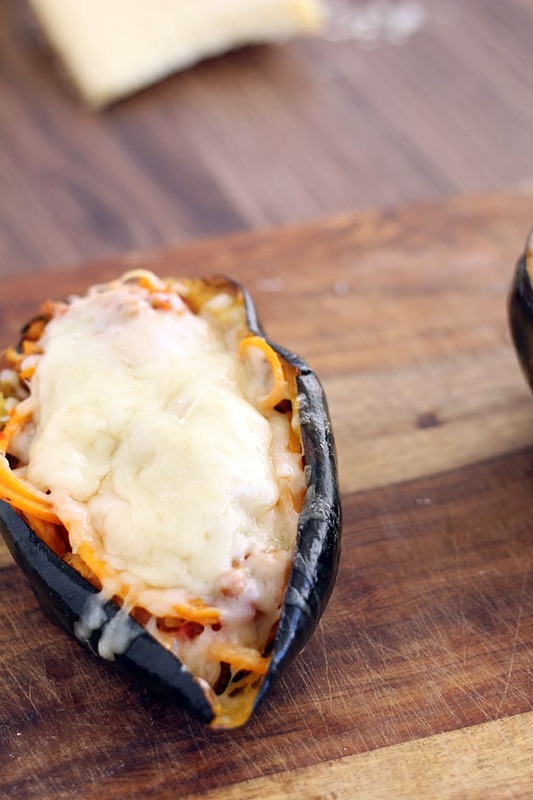 I recently made stuffed squash and I'm hooked. 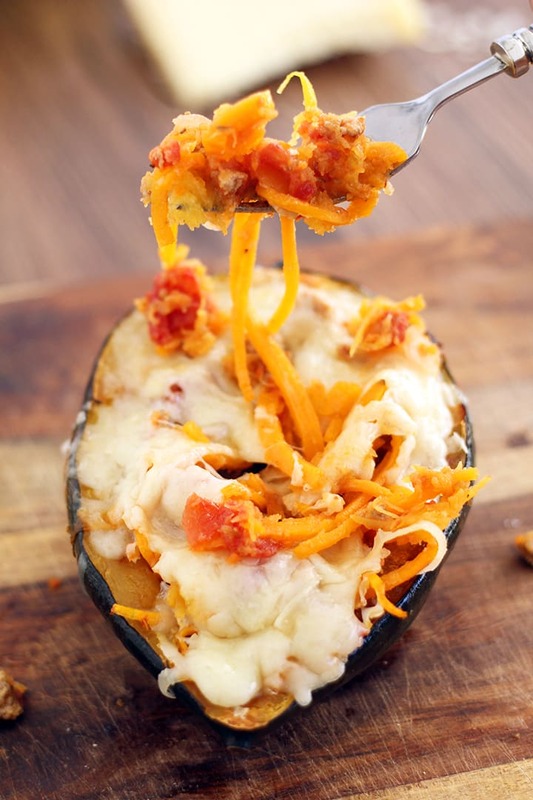 Do we sub the zucchini noodles for butternut squash noodles in the bikini bolognese recipe? Thank you!! I love all of your recipes! Love the passion and effort you put into each one! Thank you for the kind comment, Tiffany! Thank you!! I'm squash obsessed these days. 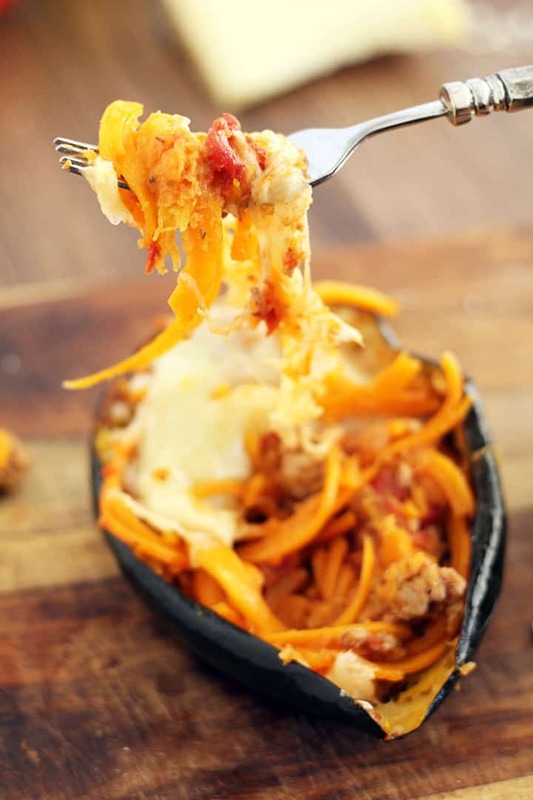 You could definitely use spaghetti squash, if you don't have the butternut squash noodles on hand! The flavors go well with many different types of vegetables, but it won't have that same spaghetti-like texture! Give it a try, I'm sure it will still be delish.